If you’re like most Americans, you spend 40 or more hours each week behind your desk. Yet most of us don’t take the time to find a chair that fits us properly. With the right chair, not only will you be more comfortable, but you’ll be more likely to avoid stress, injury and back pain. Sitting puts pressure on the spine and joints, but the right ergonomic chair provides critical lower back and leg support, which improves posture, balance and circulation. Finding the right office chair reduces fatigue and can enhance productivity—be sure you’ve got the right chair for any job! Here are ten top-rated ergonomic chairs to help you find the right fit. 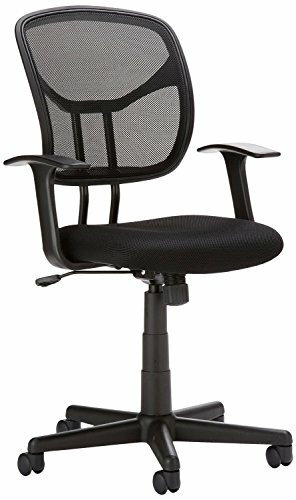 The AmazonBasics Mid-Back Mesh Chair is a great value! 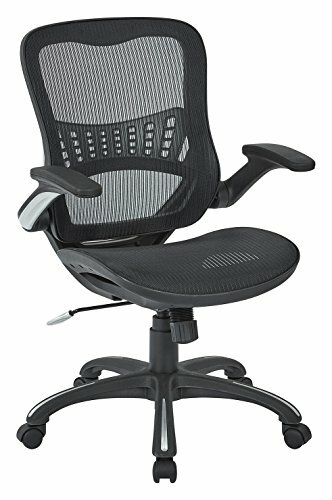 This all-purpose office chair is made of durable mesh, which allows for exceptional breathability. The contoured back, padded seat and fully adjustable seat height provide optimal comfort while keeping you in an ergonomic position. Additional controls give you the option tilt back and forth in the chair, or to lock it in an upright position. More than 80% of Amazon users give this chair a 4- or 5-star rating! Swiveling casters enable smooth rolling on carpet, hardwood, tile and more—whether you’re rolling across your office to a file cabinet, or zooming down the hall to a board meeting. Some assembly is required; product has 1-year limited warranty; appropriate for users up to 225 pounds. This chair is a great match of form and function. The contemporary style and chrome accents will look great in any office setting, and the adjustable features, including a “tilt and lock” back angle feature, adjustable arms and flexible height allow you to find the perfect fit! This chair also includes a feature to flip up the arms, making it great for those who need to pull in close to their work space—it would function excellently in a traditional office setting and would make an equally great addition to a craft room! This product comes with a 5-year limited warranty, and is rated for users up to 250 pounds. Some assembly is required, but for an additional fee you can order the chair fully assembled. The Alera Elusion Series Mesh Mid-Back Swivel/Tile Chair, constructed with long-lasting breathable mesh, ensures a cool and comfortable user experience. The plush cushioned seat means maximum comfort, and the seat’s waterfall edge relieves painful leg pressure that can sometimes occur in traditional office chairs from extended periods of use. A moveable lumbar support bulge is perfect for those with perennial lower back pain. 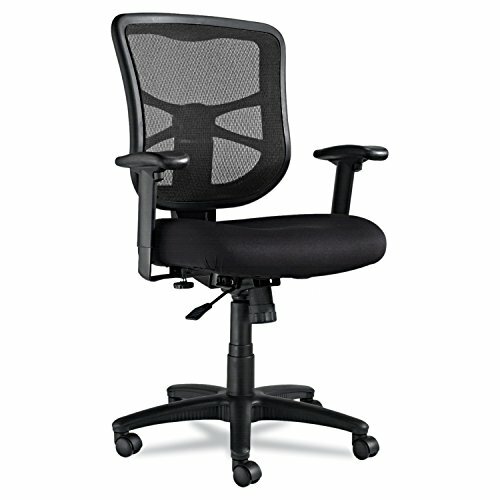 With easily adjustable features, this is a great chair for office spaces with multiple users! Assembly required; may order assembled for an additional fee. 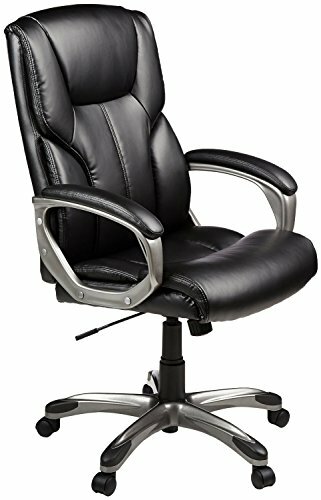 This super heavy-duty office chair combines ultimate comfort (breathable mesh, padded arms and a wide range of reclining motion) with top-notch lumbar support which cushions the spine and encourages beneficial posture. Plush carpet is no match for this chair’s dual wheel caster system, which ensures effortless rolling on any surface. Detailing on the chair, including silver accents on the arms and legs, and a sleek overall design, make this an attractive addition to any home or office. The Office Star chair comes in four contemporary colors, so you’ll have no problem finding a chair that looks great with your office décor. You may order this chair fully assembled for a fee, or choose to assemble on your own. 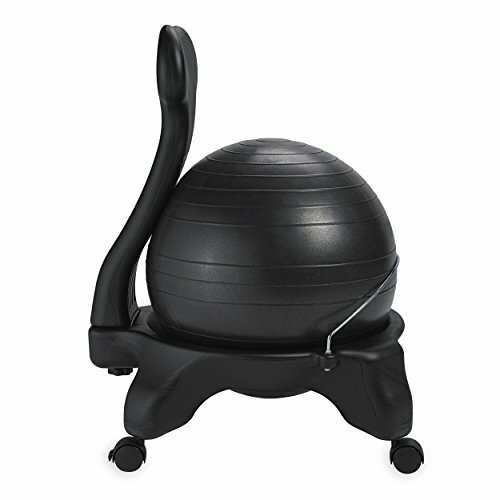 Gaiam balance ball chairs may look like something outer space, but they represent the cutting-edge in office furniture designed with your health and fitness in mind. The sturdy base of the Gaiam chair holds a balance ball—the same kind employed in your usual workout routine. The 52-centimeter ball is designed to improve balance and strength, improving your overall posture and health—which in turn aligns the spine and relieves many common types of back pain. The ball also improves core strength, and can be removed for a quick and easy workout! The stout and well-built design will comfortably hold users up to 300 pounds. Select from 9 vibrant ball colors and 4 base colors to customize this chair to align with your personal style. Includes an air pump for inflating the balance ball. Seat height varies based on weight of user and inflation of stability ball. Minimum assembly required. Do you have an injury that makes sitting in traditional office chairs uncomfortable or painful? SLEEKFORM’s unique ergonomic design relieves tension from the spine, making it a great choice for users that may suffer from slipped discs, herniated discs and/or tailbone pain. The backless style of this kneeling chair redistributes weight and aligns your spine, without sacrificing luxurious comfort—the extra-large, double-thick padded cushion, located on both the seat and knee area, provides ultimate enjoyment. SLEEKFORM is so sure you’re going to love this chair, that they offer a 90-day money back guarantee and free 30-day return shipping. 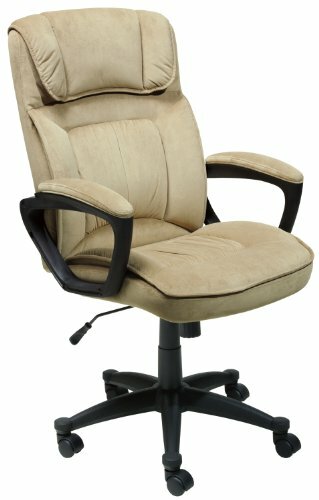 This is a perfect chair for all your office needs, or to rotate in with your regular office chair when your back needs a break! Complete instructions are included for easy assembly. This executive office chair, manufactured by Serta, provides the same back support, luxury and comfort that Serta is known for in their award-winning mattress line. The chair’s soft and pillowy exterior will make you feel like you’re at a spa, rather than the office! The durable construction and lumbar support, however, will ensure that you’re getting the lower-back support you need for a long day on the job. The cushioned waterfall edge on the chair’s seat is designed to enhance circulation and reduce pressure that can build up on the back of the legs. Plush pads along the arms provide superb comfort for arms, hands and wrists. A deluxe headrest offers superior support and comfort for your head and neck. 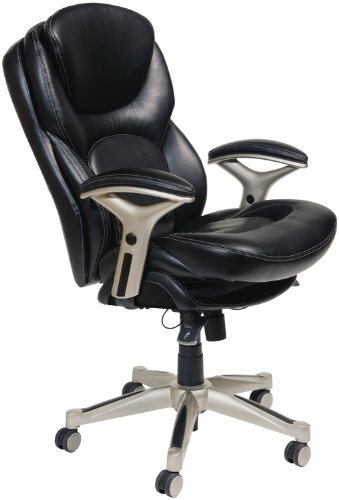 Chair includes adjustable seat height, reclining angle and recline resistance. The microfiber exterior is comfortable, attractive and easy to clean! A durable star-shaped base comfortably supports users up to 250 pounds; 1-year limited warranty included. Some is assembly is required; order with assembly by a local pro for an additional fee. 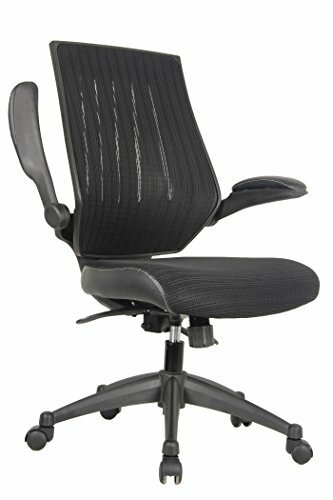 This best-selling chair from Amazon combines a sleek and professional look with ergonomic support for all-day comfort. Made from stylish black leather and silver accents, it’s a great addition to any home or office! The seat offers 360-degree swivel (a multitasker’s dream), pneumatic seat-height adjustment, a comfortable padded back and butterfly seat, adjustable tilt and state-of-the-art support for extended periods of sitting. Nylon casters provide a smooth roll from one office location to another. Find out why this chair is an Amazon #1 best seller! 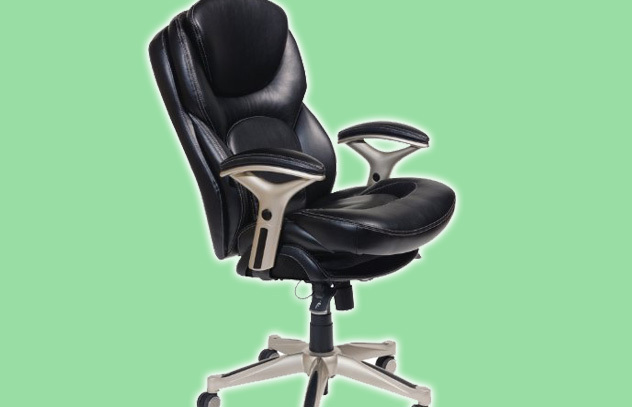 Chair is adjustable between 41.34 and 45.08 inches in height, and is suitable for users up to 250 pounds. Order flat or professionally assembled (additional fee applies); product comes with a 1-year limited warranty. From Serta, an industry leader in quality, comfortable products, comes the Back in Motion Health and Wellness Mid-Back Office Chair. This innovative design utilizes Back In Motion Active Seating Technology to provide unparalleled support and unrivaled adjustment options which pivot as you move, keeping your body aligned in a positive neutral position. Active Seating Technology moves with your body to administer lumbar support, seat adjustment and pelvic tilt as you go throughout your day. Active Seating Technology also provides long-term benefits for improved health! The stylish design made from eco-friendly leather cradles your body in supple cushioning for the ultimate in comfort and luxury. This product comes with a 1-year limited warranty. Some is assembly is required; order assembled by a local pro for an additional fee. 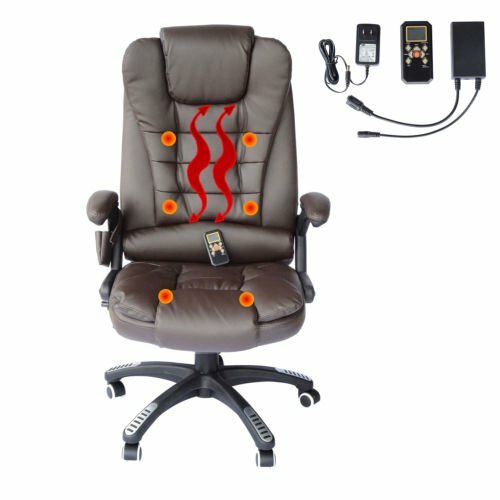 The Home Office Computer Desk Massage Chair by HOMCOM delivers state-of-the-art ergonomic support along with relaxing heat and vibration to melt away pain and soreness. Remote-controlled heat (which can be adjusted from more than 16 feet away) can be targeted to the upper back and/or lower back and legs to deliver relief where you need it most. With six different massage settings, you’re sure to find the right combination to soothe and renew tired and aching muscles and joints. A holster attached to the arm of the chair keeps your remote control handy and out of the way. This attractive chair, constructed from an eco-friendly, rich brown recycled leather has a pneumatically adjustable seat and flexible positioning to help you find the right fit for your body. Seat height ranges from 17.3 inches to 21.3 inches; seat width is 21.3 inches. Assembly required; may order fully assembled for an additional fee.